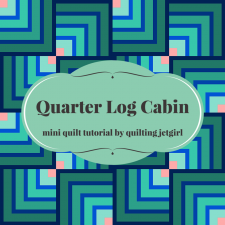 "When I posted about the mini quilt swap that I had with Christina @Wips and Tuts last Friday, I was asked if there were going to be tutorials written for the mini quilts. I decided to just jump right in and do a quick tutorial since I think there are so many fun ways to play with quarter log cabin blocks. Before I go any further, I also want to mention that Christina used a Film in the Fridge tutorial when she made the orange and blue mini quilt fore me: Quartered Squares: A Modified Bento Box Tutorial."